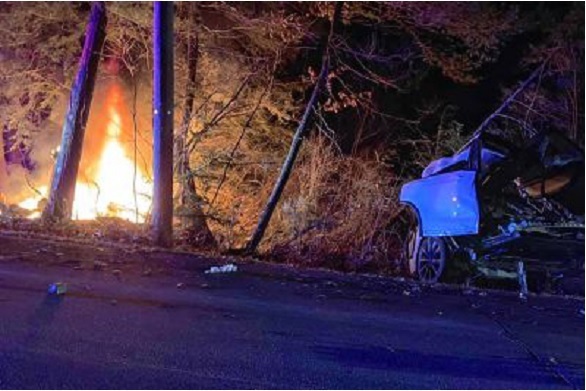 Courtesy photo by Michelle Barnhart: A Tesla X on fire after crashing into woods in Rindge on Dec. 26, 2018. One passenger died. The death of a woman who was burned when the Tesla Model X in which she was riding hit a tree is the first fatal accident involving an electric car in New Hampshire, raising the issue of emergency services’ preparation for dealing with this new technology. The crash happened in December. The passenger was badly burned and she died last weekend following several surgeries. Tesla maintains a web site that includes instructions for first responders. Each model Tesla, and sometimes certain model-years require specific recommendations for fire fighting.